When it comes time to fix or replace your commercial furnace system, rely on the experience that has become a staple in the Hanover, Gettysburg and York PA community, DESCO Services. DESCO is one of the most reliable and capable furnace replacement contractors in all of Pennsylvania. We can install or repair any type of furnace and our expertise can go to work for you at an affordable price. Businesses will experience significant gains in efficiency when installing newer equipment. There has been tremendous progress when it comes to efficiency in newer furnaces. Monthly utility bills tend to show a huge decrease as your new heating system will be running much more efficiently. Businesses generally see an immediate 40% decrease in energy consumption with the installation of a new furnace. 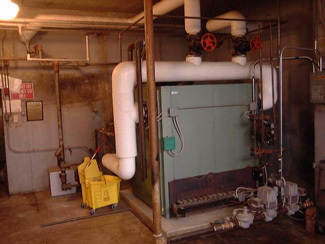 When it comes to furnace repair, there could be a host of problems affecting your system. Wiring problems, a bad circuit board, a faulty blowing motor or a dirty combustion chamber could all be fixed right away by one of the expert technicians from DESCO Services. A cracked heat exchanger, which is a carbon monoxide hazard. Significant amount of rust in heat exchanger. Furnaces that are are at least 20 years old. Extreme temperature differences inside the building. DESCO Services can come to your rescue immediately with our 24-hour emergency service. Put all your furnace problems in our hands and we will provide a quick and reliable fix for your business. Give us a call today at 717-846-3384 or 717-637-2216 or 717-337-3053.